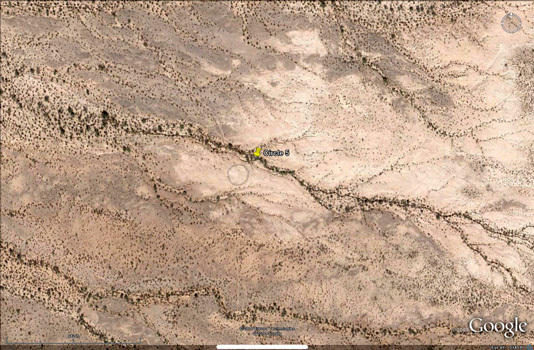 I recently used Google Earth to look at several lines of rocks near an early 1900's copper smelter at Sasco, Arizona. 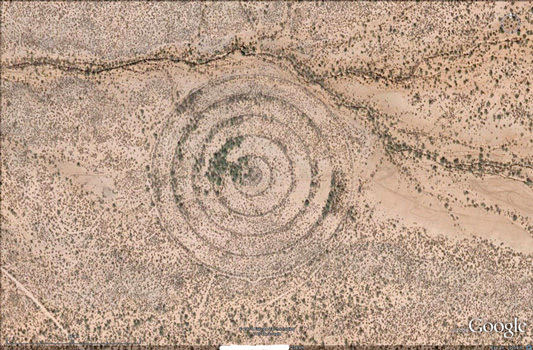 That process brought to mind an old military bull's-eye target that I had been to in the 1980's just south of Tucson. I wondered if it still existed and how visible it would be. A quick pan of the desert southeast of Tucson International Airport revealed the pattern seen in the photo at the top left. I was really surprised at the target's clarity(eye height 5000'). I knew that the target was large, but now with GE's measurement function, I could figure out that it was about 1000' in diamter. When we had stumbled onto the target years ago, there were many bomb fragments, 50 caliber bullets and ammo clips on the rings. The bull's eye was the only part of the bombing range that I knew about. So for something to do, I zoomed in with GE and cruised the desert nearby. I found 5 much smaller circles(diameters 40' and 100'). Then a few miles south, I came across another large bull's-eye target. I assumed that the larger bull's-eye had to be range related. But I had no idea what the smaller circles were about(example in the center of top right photo). Time to go check things out! Before I made the trip,Wikipedia provided more information on the range. The range was constructed and put to use in 1942. Army Air Corps crews from the local AFB were the first folks to use the range. An airstrip southwest of the target was completed in 1943. In the 50's crews from Carswell AFB in Texas were using the range. In the 1960's or so, the land was transferred from Federal control to the Arizona State Trust land program. The land is still pretty much undeveloped. Roads in the area today service City of Tucson water wells. I drove out to the Bull's-Eye and found fewer bomb fragments than I remembered. There were a few 50 caliber bullets and many 50 caliber ammo clips particularly in the center of the bull's-eye. I then walked out to the single ring circles. There were hundreds, if not thousands of 50 caliber bullets around those circles and quite a few 20 mm shells. There were no bomb fragments at any of the smaller circles. There were pieces of old lumber in the smallest circles. I could not tell their function--had they been some kind of target or perhaps parts of observation towers.